Since 2006, Tom Baker has poured out a steady stream of experimental recordings, running the gamut from ambient, drone, electronic, experimental, musique concrete, gothic instrumentals, spoken word, and (solidly for the last year), "noise music." He has recorded under the moniker EXTREME VOLUME POP, as well as various other nicknames. While the sheer volume of Tom's recordings (and the fact that they are always growing) somewhat prohibits listing them ALL here, he's selected a few he thinks are especially interesting. More recordings can be found at: Bandcamp , Soundclick, and Soundcloud. A collection of raucus, riotous experimentation, ranging from easy listening and jazz, to harsh noise, with touches of metal, rock, and spoken word. Probably the greatest recording Extreme Volume pop has ever put together, we can't believe we were ever capable of making music this damn good. . NOTE: NOT "NOISE" Music. I was privileged to see F.W. Murnau's classic of Weimar-era horror at Pruiss Hall, on the Ball State campus, many years ago, when I was still attending college. It was the first time I had ever seen an antique film on an actual theater screen, and the bonus was that a pianist performed an original score as live accompaniment. At that point, I had never recorded a single note of "experimental music" (I had only dabbled in punk rock), but the evening had a profound effect on me, putting me in another world. Hence, I present to you my personal musical evocation and homage to "Nosferatu," the most compelling and eerie vampire film of all time. In the words of Edward Van Sloan, "I think it will thrill you. It may...shock you. I t might even HORRIFY you." So, until we meet again, many pleasant nightmares. "Diatribe aside, though, Unknown presents some excellent cuts of harsh noise walls experimenting with the different sounds and sources one can make. These thirteen walls range the gamut between general static and bass, rhythmic repetition within the sound, slight momentum, crunchy bass, very fizzy mid-range shuffling, and everywhere in between. As To All My Little Friends… is presented to the listener, it’s all sort of overwhelming because of the tremendous range of sounds, which is why I sort of lobby for these tracks to be chopped up instead of melded together. Still, one gets a great feel for what Unknown can do with static and bass, and the shortness of each wall is simply a taste of how organic and original HNW can sound. Unknown - "To All My Little Friends"
All sounds and production by SELF. "You may not be able to find any pleasant sounds on this new 4-track album, but then again this isn’t about pleasantries. Extreme Volume Pop is an experimental/avant-garde project from Indiana who released Come On Get Happy at the beginning of the week (i.e. late December 2013), so for those who are into unfolding the ugliness of harsh noise wall/HNW, this will be perfect to blast in your car or in your apartment. He has created a wide range of projects in the last few years, which you may glance over by heading to the Extreme Volume Pop Bandcamp page." --From This Is Book's Music blog. "A clown can get away with murder." All music composed and produced by Tom Baker. Please use these musical evocations as you see fit! Ideal for Halloween parties, trick or treating, seances, black magic rituals, vampire or ghost hunting, or awakening the hideous, undead monsters of the human psyche. 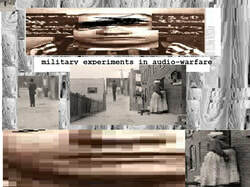 Early experimental recordings, dating from (possibly) as early as late 2005. These tracks are more dreamy, less harsh than most others. A selection of personal favorites. One version of cassette tape project from last year. Harsh noise epic. Multiple sounds converge and collide into an electrico-digital salad, asking the listener: How much can YOU endure? Synthesizer drone and ambiance. Eerie sonic explorations. A departure. Extreme Volume Pop "Effigy of the Lion"
Drone, loops, dreams, ambiance, experimental compositions, and rock all collide in this strange work. Partly noise, partly aleatoric music. Extreme Volume Pop "Heaven is Creeping: Random Tracks"
17 tracks pulled and assembled at random, running the gamut from musique concrete and drone to harsh noise and harsh noise wall. Resurrected for your listening (dis)pleasure? Extreme Volume Pop "George Chop Betty Chop Chop"
Spoken word and harsh noise excursions. 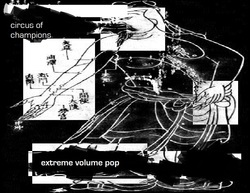 Extreme Volume Pop "Circus of Champions"
A series of forgotten recordings, rediscovered and remixed. Harsh noise, and somewhat accidental, unlikely combinations. 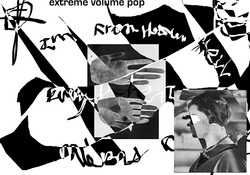 Extreme Volume Pop "Dead Men Have No King"
Harsh noise terror/ harsh noise walls. Extreme Volume Pop "An Ed Gein Movie"